We finally did it! We moved the girls into the same room, and they are loving it. I have to say, I’m loving it, too. It has it’s moments, like naps are pretty much irrelevant at this point for my youngest when the oldest is in there with her. And they tend to wake each other up in the mornings. But, all in all, this has been such a great experience, and I’m so glad we finally got ourselves organized enough to do it! The original inspiration for this project came from a pin on Pinterest from iHeartOrganizing. 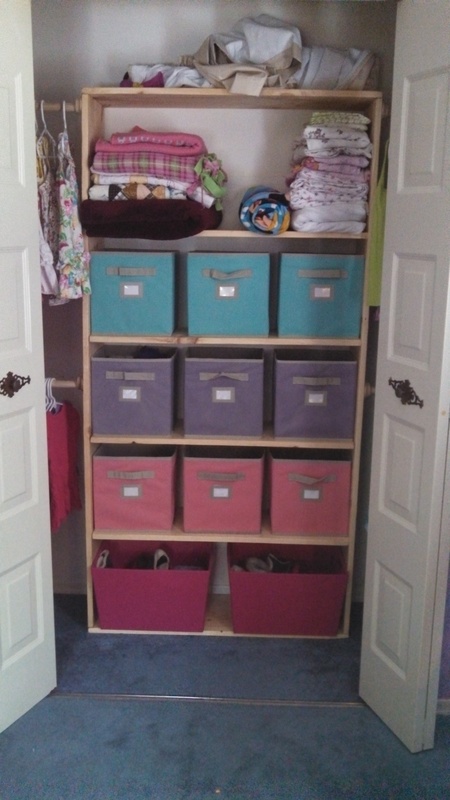 However, after looking at prices and realizing we would probably need a little more storage space in the closet itself, we decided on a DIY shelving system that could hold more storage bins. The photo above is what DH and I finally agreed upon…and I couldn’t be happier! Each girl gets her own set of colored bins (the blue ones are for overflow), and each bin holds something different (one has socks/underwear/swimsuits, one has PJs, and the other has seasonal bottoms). 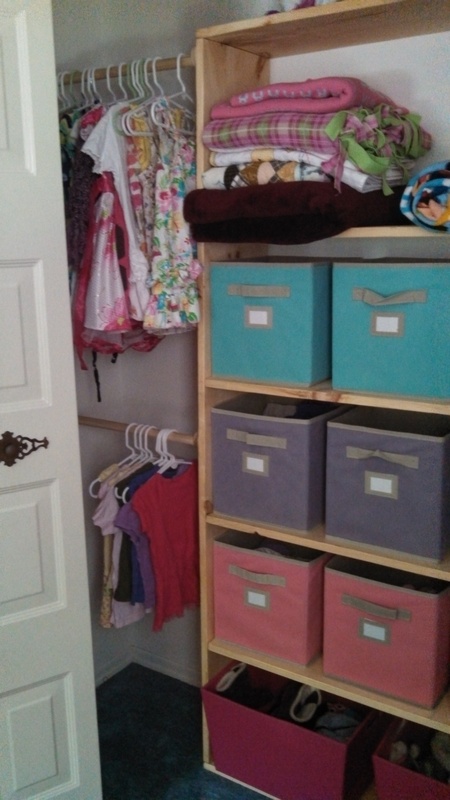 The bins on the bottom shelf hold each girls’ shoes. I need more hangers, but I’m hanging shirts on the bottom and dresses on the top, and each girl gets one side of the closet. 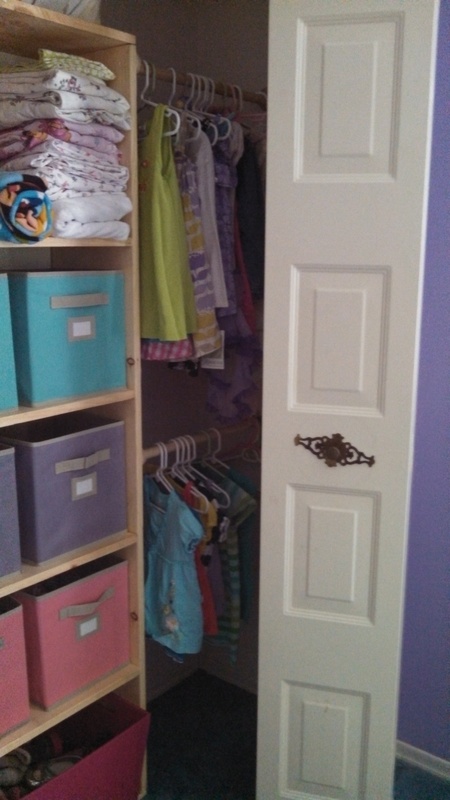 We’re actually close to not needing ANY dresser in their room…ANY! I’m already coming up with things to do with the extra space (a little reading nook in their room, since they have so many books – add that project to the list). While this all may have started from a simple pin, it’s leading me towards becoming content with what we have. Is this my dream house? No. But turning it into our home is bringing peace. It’s also helping our family to realize there are more important things than “keeping up with the Joneses”. Maybe someday we’ll have our dream house, and we’ll keep taking steps to get to that point. For now, this is where God has us, and I need to leave all of this up to Him. I’m blessed to have a roof over my head, food on the table, and family and friends by my side to share in this joy. I pray that you all learn to be content wherever you are, too.